NEW YORK — New nationwide polling commissioned by the National Institute for Reproductive Health confirms that large majorities of voters across the country disagree with the recent trend of new state laws restricting access to abortion, and instead support affirmative policies that make a woman’s experience in having an abortion more supportive, respectful, affordable, and without embarrassment, pressure, or shame. In January 2016, the National Institute commissioned PerryUndem Research/Communication to conduct a national survey of voters’ awareness of and views toward the trend of abortion restrictions, and how those views align with their preferences for abortion-related policies. Large majorities of voters (at least 70 percent) said that they want abortion to be legal, supportive, without pressure, affordable, and available in a woman’s community. Even greater majorities (more than 90 percent) want a woman’s abortion experience to be safe and informed by medically accurate information. Only around one in five voters suggest the experience should be expensive, uncomfortable, logistically difficult, or embarrassing. Instead of restrictions on abortion, voters support policies that correspond to how they want the experience and the accessibility of abortion to be for a woman. Large majorities support allowing health care providers to care for patients without political interference (86 percent), preventing politicians from forcing doctors to give women medically inaccurate information (83 percent), ensuring the safety of providers and women accessing care (77 percent), guaranteeing a woman’s right to abortion under their state laws (66 percent), and ensuring abortion is covered by insurance (62 percent). The new poll results build on 18 months of qualitative research by PerryUndem and the National Institute in Colorado, Georgia, Florida, Michigan, New York, Ohio, Texas, and Virginia, which consistently found that voters across all demographics are outraged at the legislative overreach on abortion and think our laws should go in a different direction. Proactive policies like those preferred by voters have begun to be introduced in state legislatures in recent years, with policymakers and advocates advancing twice as many pieces of proactive reproductive rights and health legislation in 2015 as they did in 2014. PerryUndem conducted a national survey among n = 1,109 registered voters from December 17, 2015 to January 15, 2016. The survey was administered online using GfK’s Knowledge Panel. The margin of sampling error for results is + 3.3 percentage points. View the full poll memo here. 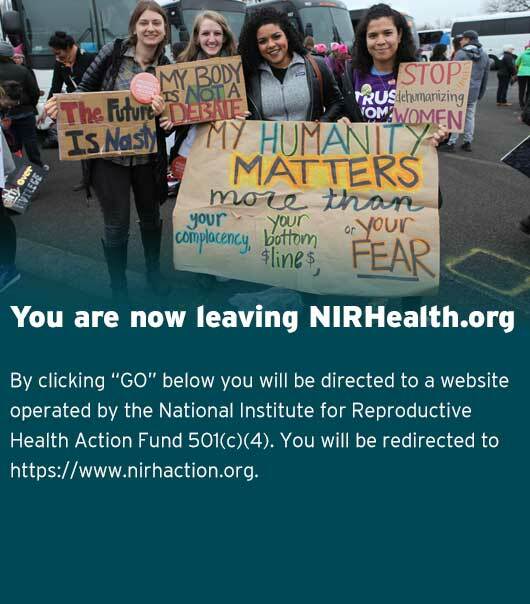 The National Institute for Reproductive Health works across the country to increase access to reproductive health care by changing public policy, galvanizing public support, and normalizing women’s decisions to have abortions and use contraception. The National Institute conducts independent public opinion, communications, and policy research and analysis, and partners with local, state, and national organizations, providing funding, strategic guidance, capacity building, and technical assistance.